Edited by the NCRR Editorial Team, led by Lane Hirabayashi, UCLA emeritus professor and published by the UCLA Asian American Studies Press, the book will be released to the public at a book launch party at the Japanese American Cultural and Community Center, Garden Room A, from 2 to 4 p.m. on Saturday, June 16. The NCRR Editorial Team, including Richard Katsuda, Suzy Katsuda, Kathy Masaoka, Ochi and Janice Yen, thanks all the many contributors to the book — those who advised them, wrote articles, loaned their photos, or helped to edit and index. They give special thanks to Hirabayashi, who, some five years ago, took on the task of editing down an overwhelming amount of material into a 400-page book without sacrificing the heart of the stories. The team is also pleased to have a visually attractive book designed by Los Angeles-based artist Qris Yamashita. The book is full of photos, taken mostly by NCRR members, that complement the individual stories. 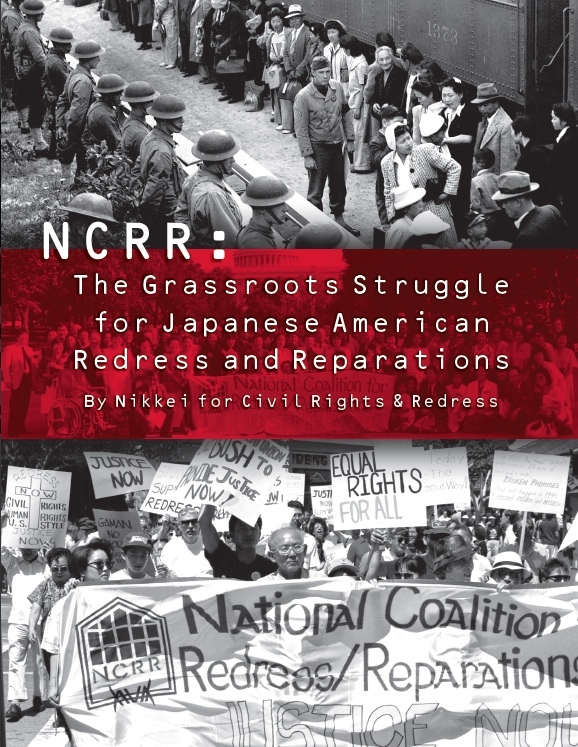 The community will be able to purchase “NCRR: The Grassroots Struggle for Japanese American Redress and Reparations” at the special “launch price” of $25. After June 16, the order form will be available on NCRR’s website (www.ncrr-la.org). The book can also be purchased at the Japanese American National Museum bookstore after the launch at a price of $30. Part 1 is called “History and Origins of NCRR” and begins with Glen Kitayama’s UCLA thesis titled “Japanese Americans and the Movement for Redress: A Case Study of Grassroots Activism in the Los Angeles Chapter of the National Coalition for Redress/Reparations,” a thoroughly researched study of NCRR’s organizing principles and its roots in the Little Tokyo Peoples Rights Organization (LTPRO). NCRR received a grant from the Civil Liberties Public Education Fund to record the oral histories of some of the founding members, such as Bert and Lillian Nakano, Alan Nishio, Iwataki and Jim Matsuoka as well as the current leadership. These excerpted pieces, titled “Ordinary People, Extraordinary Deeds,” help to give the backgrounds and motivations of some of the people who shaped NCRR. Part 2 is called “Voices of Transformation: Community Organizers and Activists” and starts off with Matsuoka’s prologue, “Waiting for Justice to Find Its Time,” which provides a background of the times and a reflection on why it took until the late ’70s for Japanese Americans to seek justice. Part 2 also includes 50 stories written by NCRR members and friends, past and present. These first-hand accounts of the many individuals who participated in the diverse campaigns waged by NCRR reveal the sense of empowerment felt by ordinary people. 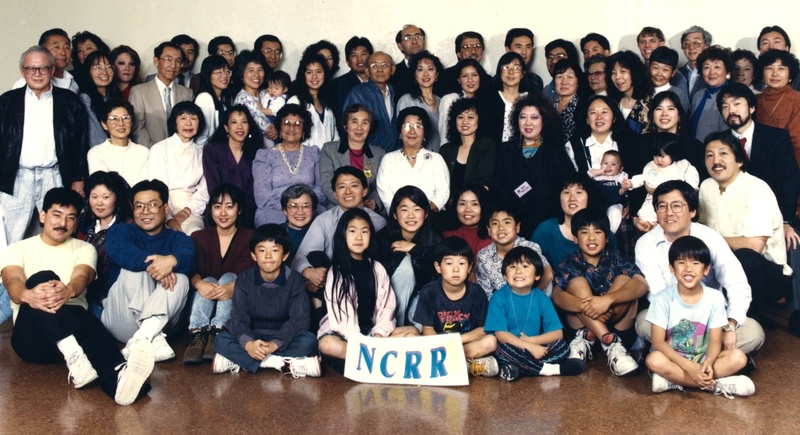 NCRR members at the 1991 Day of Remembrance program in Los Angeles. The titles of the chapters give some idea of the themes of these individual stories. “A New Generation of Activists” includes the impact of NCRR on today’s youth both here and in Japan. There is a special color section of 16 Day of Remembrance posters created by community artists and an NCRR chronology at the end. NCRR and UCLA AASC hope that the community will join them at the book launch and party to honor the work carried out by so many and to commemorate the community’s redress victory. The Editorial Team tried to cover as much of the history and current work of NCRR as they could, but realizes that there is much more to the legacy. Future readings in Los Angeles as well as in the Bay Area will be posted on the NCRR website and will be an opportunity to apply the lessons from this historic grassroots struggle.